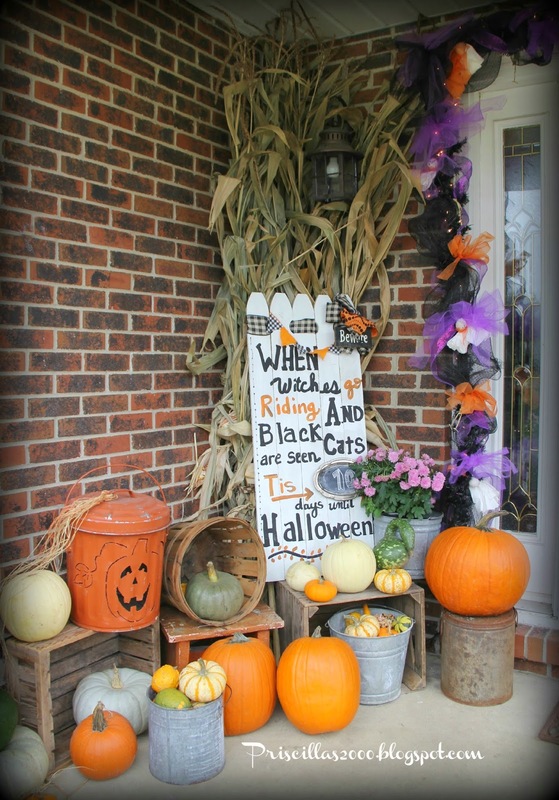 I finally was ready to tke the Fall off the front porch and replace it with Halloween .. 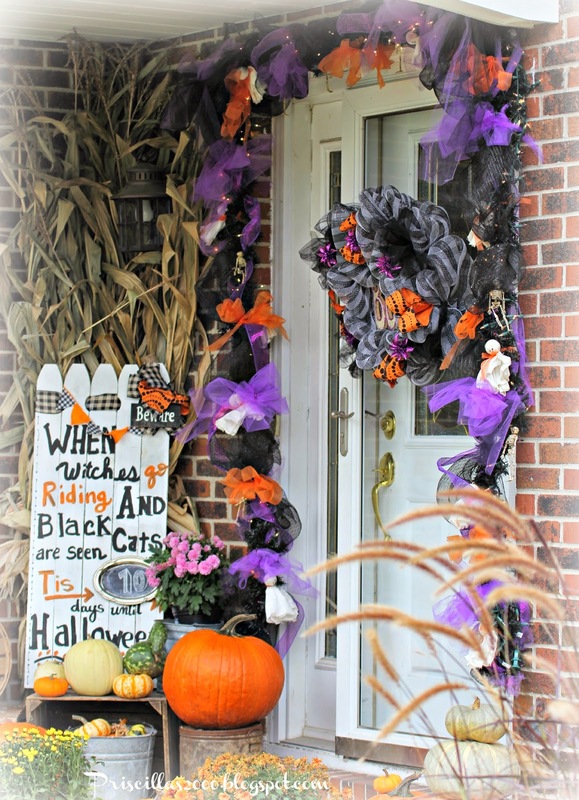 I used the same garland and wreath as last year but added more purple tulle bows to the garland.. 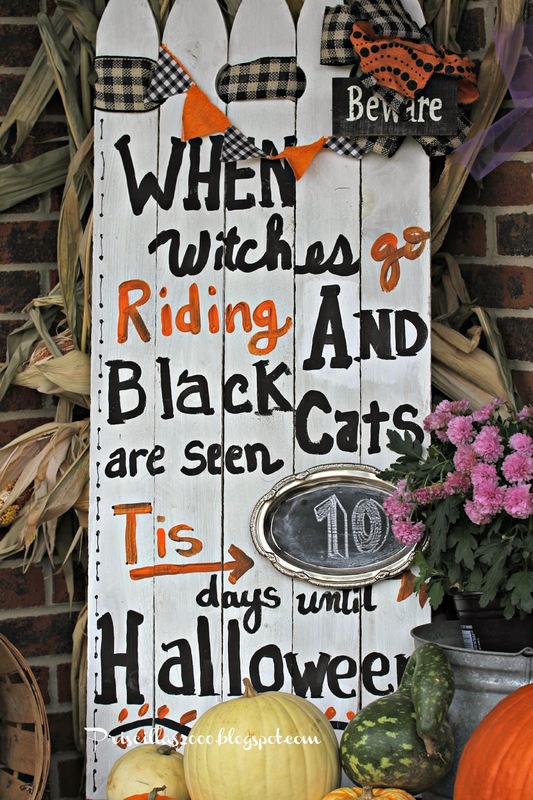 I made the Halloween countdown sign last year with a small chalkboard .. 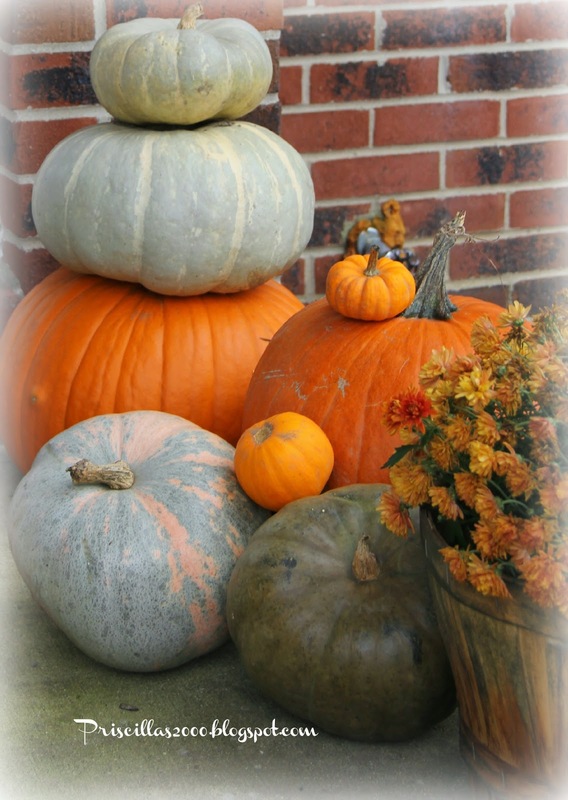 I left the cornstalks ,mums and buckets of gourds ..
and just rearranged all of them. 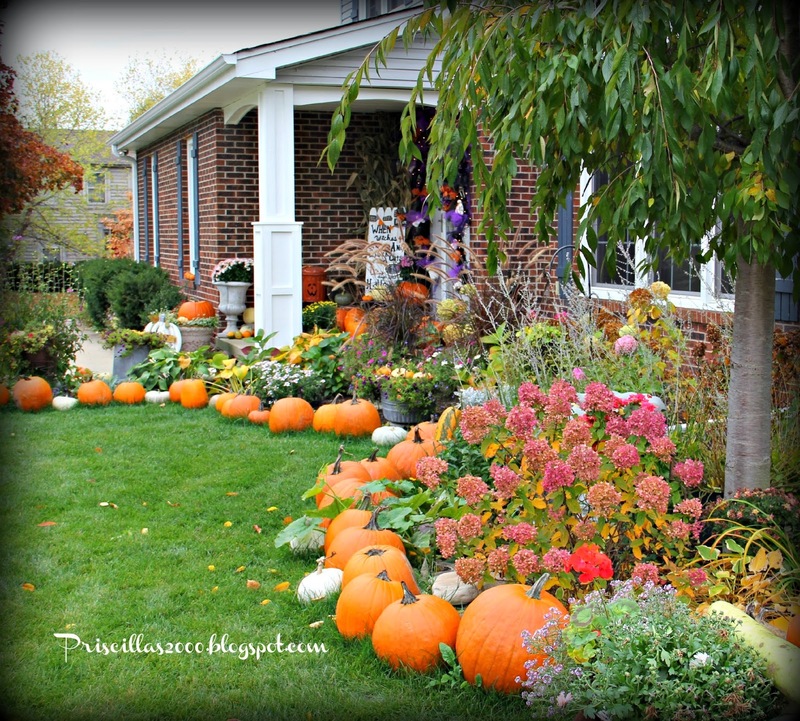 Pumpkin carving will happen this weekend .. so there will be alot less pumpkins around the flower beds . 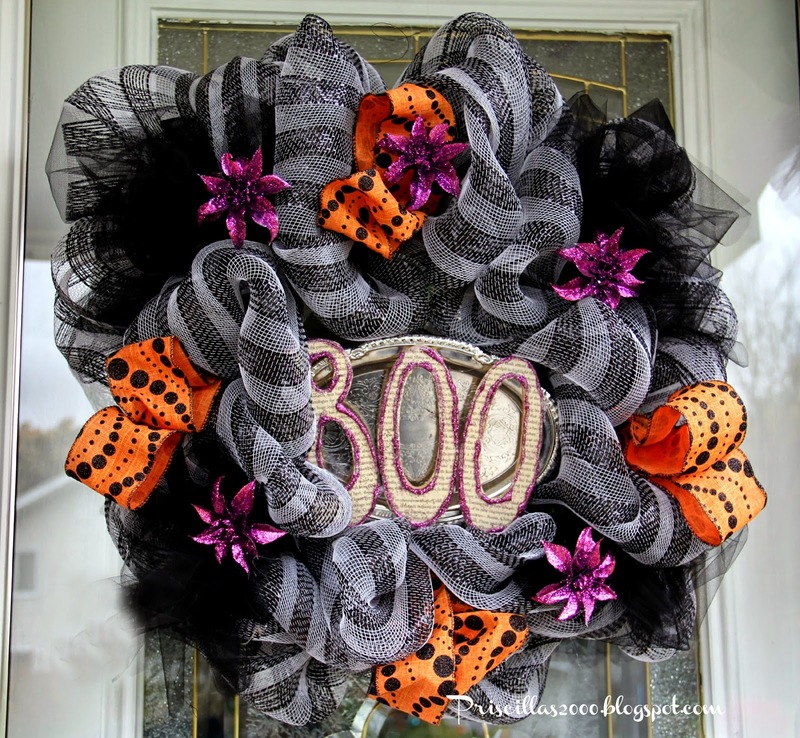 The wreath is made from decomesh and a silver tray ..you can read more about it here..
love a stack of pretty pumpkins! Thanks so much for your visits and wonderful comments on my blog ! 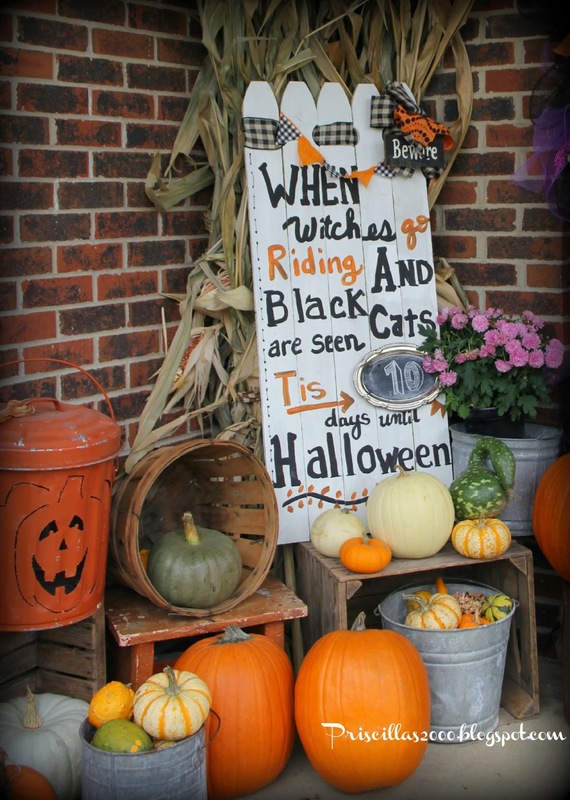 Love your Halloween decorations! 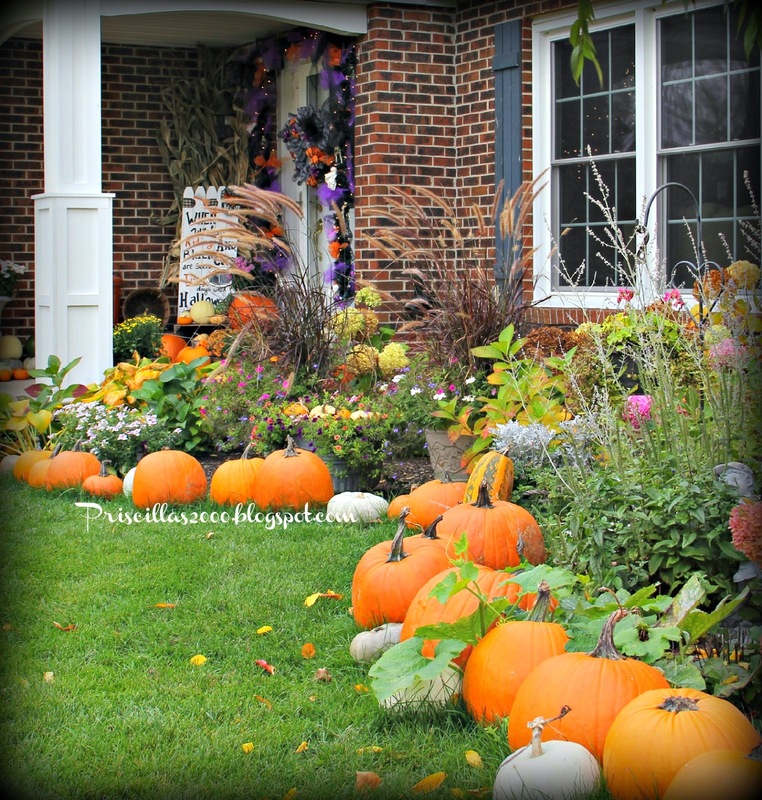 And those pumpkins make your house look like it is sitting smack dab in the middle of a pumpkin patch. Great job! What a great porch. 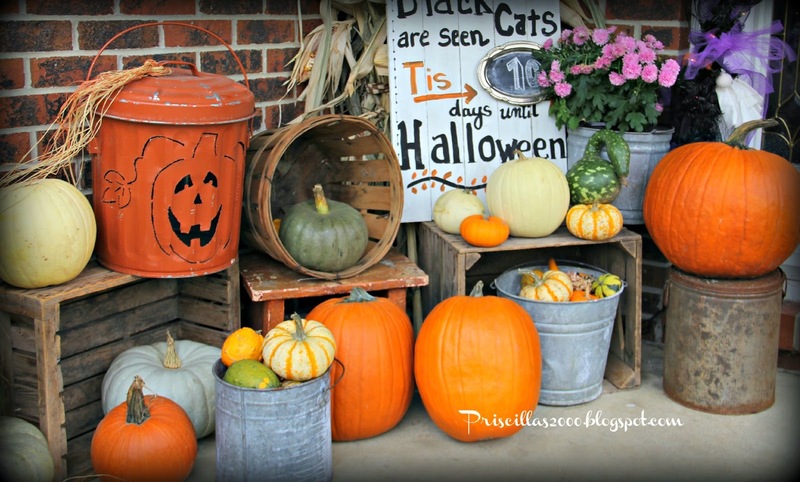 I love that orange bucket with the lid and pumpkin face! You have the best decorations!!! I so wish I could come Trick or Treating at your door!!!!! 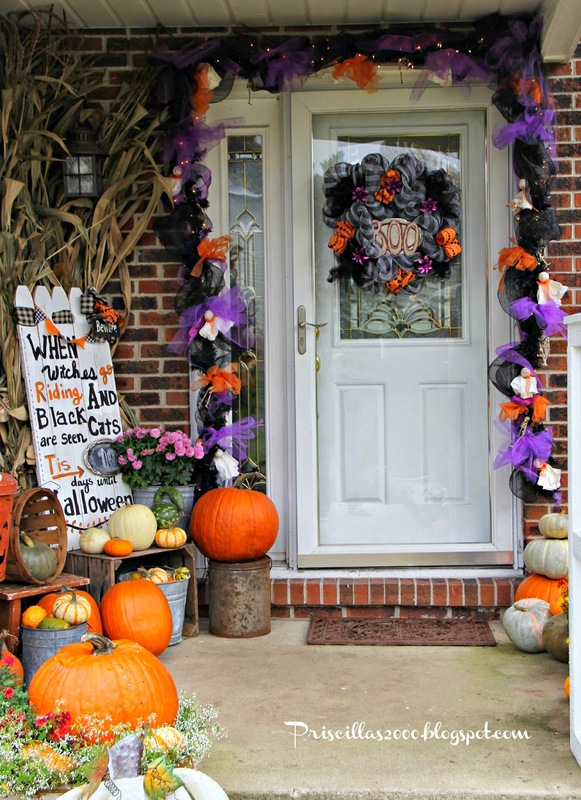 I wish I could be a little child trick or treating at your front door. Soooo festive.. I have a question.. Is your fountain grass in the ground or in pots ? Love it. Absolutely love it!! 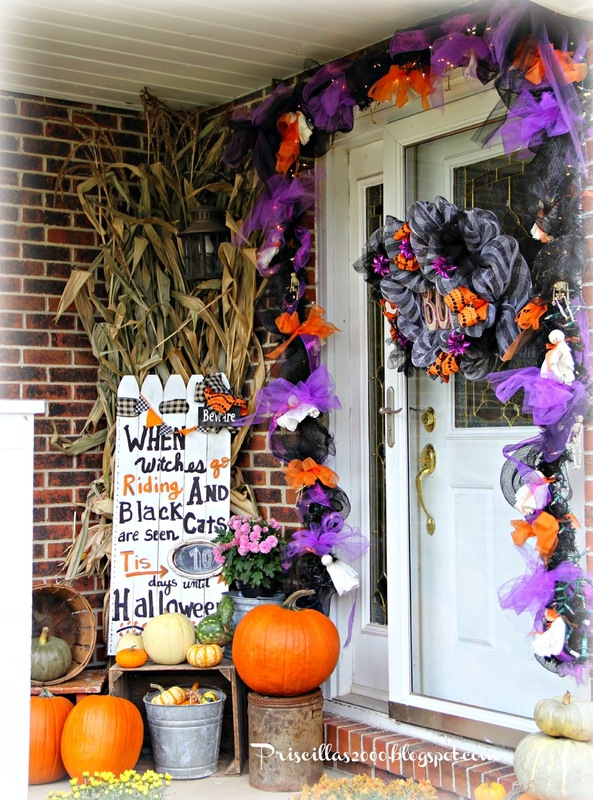 LOVE the sign and the wreath is spectacular!! 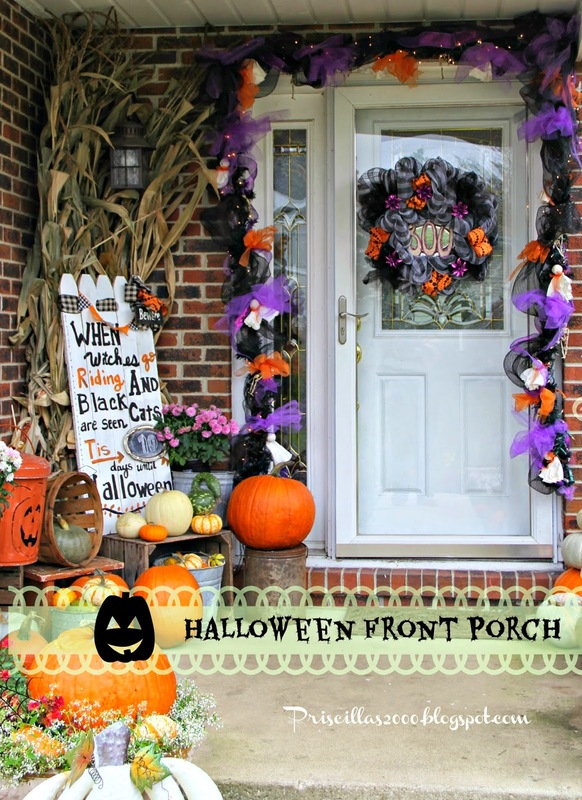 Priscilla, you always do such a great job with your porch! My friend made a sign like that and gave it as her gift at our Clubs Halloween Party. I wondered if she had seen yours on Pinterest. I too love a stack of pumpkins! Have fun carving. Thanks for sharing with SYC. 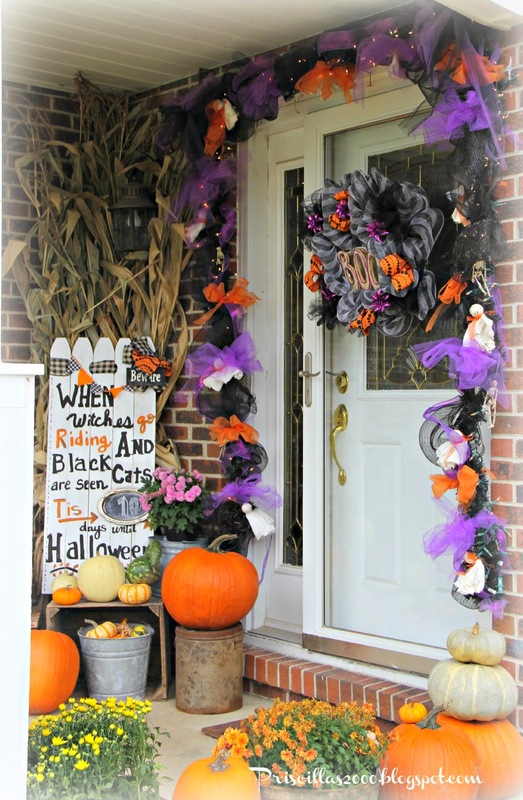 What great fun to approach your front door!!! Love it all!!! 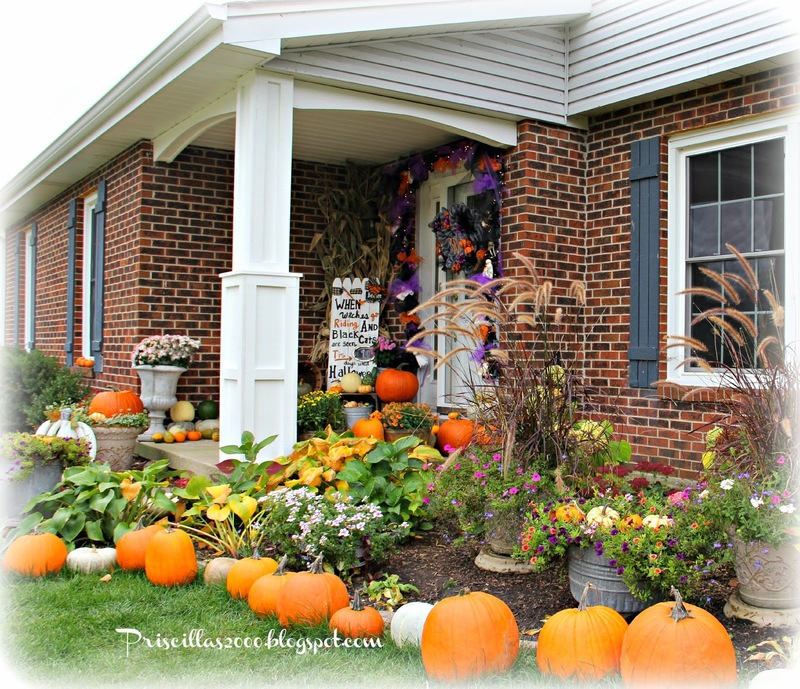 Do you keep Fall up till Thanksgiving? I do! Oh my word, this is fantastic. 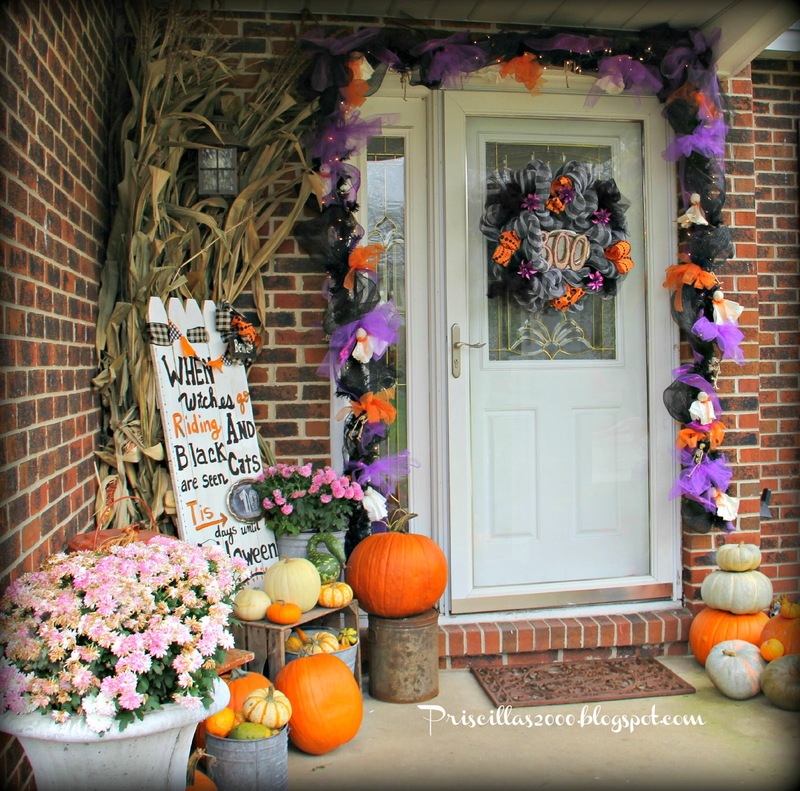 What fabulous Halloween decor. Thanks tons for linking to Inspire Me. What a fantastic front porch and yard! Love the colors and that terrific sign. Happy Halloween!